Side X Side Customs is proud to announce the Kawasaki Teryx HID Hi/Low Kit made for the model year 2008 and 2009. 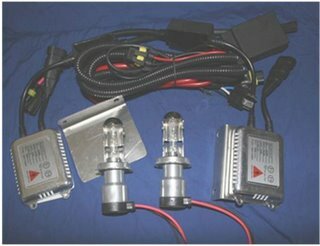 This kit features two slim 35 watt ballasts that draw a total of 3.2 amps and features a 6000K bulb for the brightest light possible. The bulbs are designed to move when you use the factory headlight switch to a High and low position. The kit also includes mounting bracket for the slim ballasts to help integrate with the factory headlight assembly bracket; this helps keep the installation clean and simple. This is a true plug and play kit that come with a one year warranty and phone support. Side X Side Customs has over 20 years of electronics experience and within the past 4 years has been concentrating on the UTV market bring quality and affordable electronic parts and accessories to the UTV marketplace. Call us at 1-818-846-1037 or visit us on at www.sidexsidecustoms.com to place an order or for additional information.